This flavorful lentil loaf makes for a great meatless meal. Most people think that a meatless meal is boring and full of veggies. Last year when I attended my son's military ball, I ordered the vegetarian meal as I don't eat meat. I was shocked at what they considered a vegetarian meal when they brought out my plate. They simply served me a plate of mashed potatoes and vegetables, the same thing everyone else had on their plates, just without the meal. This was a fancy restaurant and the chef considered this to be a vegetarian meal. I just don't understand as it is so easy to make a delicious meal for vegetarians. The way to make meatless meals taste wonderful is by using flavorful sauces and herbs along with meatless protein options. Eating vegetarian does not mean you have to eat boring meals of vegetables. 1. Combine your chia and water, mix together and set aside to let it gel. 2. Combine the lentils, onion, garlic, salt, and oil all in a skillet and cook on medium until onion and lentils are soft about 10 minutes. 5. Then add the oat flour and gelled chia to the lentils that are in a large bowl. Stir in the cranberry sauce, the chopped cashew nuts, and 1/2 cup water. 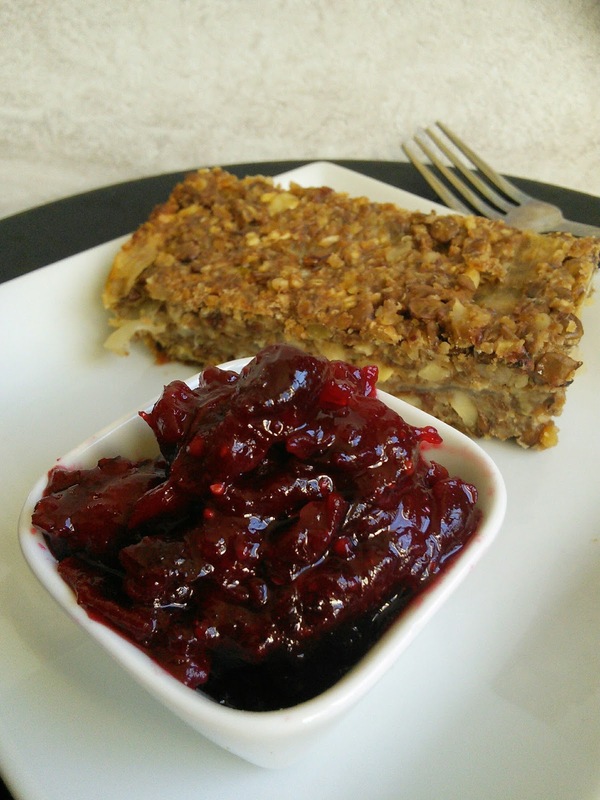 When the lentil loaf is done, slice into slices and serve with the cranberry glaze. Mix all ingredients in a saucepan over med-high heat and bring to a boil. Stir for ten minutes and lower heat to a simmer. Simmer for 5 minutes without stirring. Use this flavor glaze over the lentil loaf. Ooh you know how to make me hungry this sounds absolutely amazing. I love cranberry. This looks good. I've had the same experience as well. I went to Caljm Jumper one year for Thanksgiving due to not having a kitchen to cook and asked for a vegetarian option. They gave me mashed potatoes and vegetables. They wouldn't even give me a side of stuffing. I was so disappointed. Several sound good, but I think I would like to try the Chipotle & Onion most. I love the flavor chipotle adds and love the combination with onion. I could see this flavor being fun to experiment with. Wow there are several delicious looking recipes! I would definitely make the Couscous crusted salmon with savory pineapple glaze recipe first... as I LOVE salmon and this sounds so delicious and very different than how I have made Salmon in the past. Thanks for the fabulous opportunity and good luck to all! I want to try the Savory Pineapple. It sounds like something my family would enjoy. Would love to try the Onion & Shiraz....sounds like it would be a great addition to a work-night meal!! I would like to get Top Mates' Chipotle & Onion Chipotle & Onion sauce because it would be great on baked chicken breasts. Chipotle and Onion sounds amazing! Those look absolutely lovely! I'd love to give these products a try. Meatless meal interesting I can do without the meat will have to try! I would love to try the Savory Cherry and Savory Pineapple. Honestly i never heard about them. but it looks great thanks for sharing the recipe. Never heard it before. I need to try this, it looks so yummy. I would like the savory pineapple to go with cream cheese and crackers. Savory Pineapple sounds so good love to try it we just love pineapple sounds so good. I would love to try the Grilled Pork Chops with Pineapple Finishing Sauce Recipe. It sounds amazing and I would love to try it because Pineapple makes everything great! I would like to try the BBQ CHICKEN WITH TOP MATES CHIPOTLE & ONION OR ONION & SHIRAZ FINISHING SAUCE RECIPE because I like spicy dishes. I'd love to try the Top Mates Chipotle & Onion sauce. I love spicy sauces. That looks so yummy! I'd love to try the Savory Cherry sauce. I would like to try the Grilled Pork Chops with Pineapple Finishing Sauce because I like pineapple. I am totally intrigued by these sauces! Must check them out NOW! I can't wait to try these delicious flavors! They have some very unique varieties. My favorite is the chipotle and onion. I would like to try the Pineapple! Smoked Tomato and Savory Cherry both sound delicious! I would like to try the Top Mates Chipotle & Onion over some fish. The savory pineapple AND savory cherry sound absolutely delicious. I'd most likely marinate chicken with them or just cook with it in general. I bet it would taste amazing. I want to try the ONION & SHIRAZ because this would be great to have with steak. We love garlic, so the first sauce I would want to try is Caramelized Garlic. I would like to try the Savory Pineapple because I love savory and sweet flavors together. My husband would love the Cherry sauce. I'd like to experiment with it using grilled turkey tenderloins. So many awesome sauces. I would love to try the caramelized garlic because I love garlic everything! It would be delicious on all kinds of dishes! I love and adore pineapple, so I'd definitely go for the savory pineapple! I like lentils and my family enjoys trying new sauces. I think they'd enjoy this. I want to try the Top Mates Savory Pineapple Finishing Sauce with the THAI STYLE PORK MEATBALLS WITH RICE NOODLE SALAD & SAVORY PINEAPPLE RECIPE. I love this type of flavor and feel like this sauce would be wonderful. The cranberry kind sounds wonderful!! That looks so delicious. I would love to try these sauces. I'd really like to try the pineapple- I love tropical tastes! This looks so yummy! The pineapple especially too! Looks absolutely delicious, I would love to try it out! I think I would like the apple and mint sauce but the others look good too. The chipotle onion sounds good, because I love chipotle. I'd like to try the Top Mates Caramelized Garlic sauce. I'd love to try the Top Mates Caramelized Garlic...it sounds so delicious! I bet it has such an amazing garlic flavor!! I think the Top Mates Caramelized Garlic sounds so good! I am totally drooling over here with those spreads! I love, love, love anything with goat cheese so I'd really like to try the Crisp Savory Tart with fresh goat cheese, honey, pine nuts, Onion & Shiraz Sauce Recipe. I would like to try out the Chipotle & Onion sauce because I love a little spice and savor in my dishes. I would love to try - CHARGRILLED STEAKS T-BONES OR NEW YORK FILLET WITH AUSSIE FINISHING SAUCE RECIPE. Yum!! I am a steak lover and would love to try the CHARGRILLED STEAKS T-BONES OR NEW YORK FILLET WITH AUSSIE FINISHING SAUCE RECIPE. I could eat that every day! I would like to try the Caramelized Garlic. I love garlic!! I would love to try the caramelized garlic. I use garlic in a lot of my cooking and think this sounds amazing. I'd love to try the Caramelized Garlic first. Because I LOVE garlic on everything, it just wakes up the flavor! And when it's caramelized, it's got that smoky sweetness.....Yummy! I want to try the Top Mates Savory Pineapple. These remind me of when we were stationed in England! I would love to try the Chipotle and Onion. Grilled Pork Chops with Pineapple Finishing Sauce Recipe, I love pineapple and pork chops. The Savoury Cherry sounds so good with the turkey/ham sandwich. It's a toss up between the Savory Cherry or Savory Pineapple. Both would be great with wild duck! I like to try the caramelized garlic sauce because I love to add garlic to a lot of my dishes. I would like to try the Chargrilled Steaks T-Bones or New York Fillet with Aussie Finishing Sauce Recipe. Oh my gosh, it sounds amazing and tasty! I'd like to try the Crispy Skin Duck Breast with Top Mates Savory Cherry Aussie Finishing Sauce Recipe, because I like duck breast in a wine reduction and I'd love to try it with cherry! Oh wow! Carmelized Garlic?! That sounds amazing. The cherry sauce looks great too. I would love to experiment with it! I think the Chiptole and Onion would go great with some Gardien. I would like to try the chipotle and onion sauce because I love chipotle. I would love to try the Savory Pineapple most of all because my favorite fruit is pineapple & it just sounds delicious! I'd love to try out the Chicken and cashew nut stir-fry with Chipotle & Onion Recipe, it looks really good. I like to try Caramelized Garlic, because I love garlic. I would like to try the smoked tomato! I love a good red sauce! Also I love that it is vegan. I'd like to try the Crisp Savory Tart with fresh goat cheese, honey, pine nuts, Onion & Shiraz Sauce Recipe because I love goat cheese and it seems like it would be delicious with the Onion & Shiraz Sauce. i would like to try the CARAMELIZED GARLIC, it would be good on some rice and chicken. CHIPOTLE & ONION we just love the combination and love spicy food here. I would like to try the Grilled Shrimps with Chipotle & Onion Aussie Finishing Sauce Recipe. I would like to try the Savory Pineapple. I make stir fry a lot and this would be a perfect sauce to add to it. I'd love to try the Caramelized Garlic because I love garlic!